The Dells of the Wisconsin River, also called the Wisconsin Dells (from French dalles, or narrows), is a 5-mile (8-km) gorge on the Wisconsin River in south-central Wisconsin, USA. It is noted for its scenic beauty, in particular for its unique Cambrian sandstone rock formations and tributary canyons. The cliffs, some over 100 feet (30 m) high, and side canyons are closed to the public to protect sensitive ecological features. The viewing of the rock formations by water is a popular tourist attraction in the area. The nearby city of Wisconsin Dells is the center of summer tourist activity, much of it in the form of the theme parks unrelated to the river features. The Dells of the Wisconsin River is owned by the Wisconsin Department of Natural Resources. It was established as a State Natural Area in 1994. The Dells was formed during the last ice age approximately 15,000 years ago, although the rock itself is much older, dating from the Cambrian approximately 510-520 million years ago when the area of Wisconsin was at the bottom of a shallow sea. Approximately 19,000 years ago, the Dells was at the extreme western margin of the continental glacier. However, the Dells itself was never covered by glacial ice sheets - it was part of the large Driftless Area that was bypassed by the ice. The melting of the glacier formed Glacial Lake Wisconsin, a lake about the size of Great Salt Lake in Utah and as deep as 150 feet (45 m). The lake was held back by an ice dam of the remaining glacier. The eventual bursting of the ice dam unleashed a catastrophic flood, dropping the lake's depth to 50 feet (15 m) and cutting deep, narrow gorges and unusual rock formations into the sandstone seen today. The area of the Dells provides a mixture of plant communities, including northern and southern oak and pine forests, as well as oak savanna, moist cliffs, and dry cliffs. Cliff cudweed (Gnaphalium obtusifolium var saxicola ), which is known in only two places on Earth - in the Dells and in the Kickapoo Valley, grows on protected rock ledges. Among the rare animals in the dell are six dragonfly species, including the Royal river cruiser (Macromia taeniolata), six rare mussels and numerous species of birds. The cultural history of the area stretches back several thousand years, from early Paleo-Indian people to the more recent Native American peoples, such as Ho-Chunk, Sac, and Menominee, who left behind effigy and burial mounds, camps and village sites, garden beds, and rock art. The Dells were made famous in 1886 by the photographer H. H. Bennett, who took the first stop-action photo of his son jumping onto Stand Rock. The area is now owned by the Wisconsin Department of Natural Resources and was designated a State Natural Area in 1994. 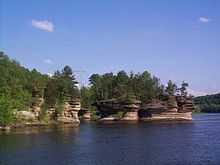 ^ "The Dells of the Wisconsin River" is generally used in the singular. ^ "Dells of the Wisconsin River State Natural Area". Wisconsin Department of Natural Resources. 10 May 2013. Retrieved 13 July 2013. ^ "Dells Of The Wisconsin River (No. 283)". Wisconsin Department of Natural Resources. Retrieved November 19, 2017. ^ "Wisconsin Dells History". Wisconsin Dells Tourism Authority. Retrieved 13 July 2013. Wikisource has the text of The New Student's Reference Work article about "Dells of the Wisconsin River".